Rain over the past week has kept temperatures uncharacteristically low in south Louisiana. Fear not, because we'll be creeping in to the 90s before you know it. However, with proper conditioning, tackling the summer heat is easy enough. You'll have to suffer through some slow muggy runs through June, but it'll be worth it when you break the barrier and get accustomed to the summer sizzle. Just be sure to stay hydrated during every workout! Races don't shy away from the month of June, with a number of options being offered each weekend. Here's is a list of what's on tap for the month, with each race's name below (in orange) being a link to more info and registration options! Summer Series Race 2 Mile (Wednesday, June 4th @ 7 p.m.) - The New Orleans Track Club hosts this bi-weekly event at the City park Festival Grounds on Wednesdays in June and July. Each week is hosted by local running organizations, with the Chalmette Track Club and Metairie Runners hosting the first week. It's free for NOTC members, $5 for non-members. Q50 Races Run to the Hills 10 Mile & 5 Mile (Saturday, June 7th @ 8:30 a.m.) - This BYOB event isn't what most New Orleanians are used to, because in this case it stands for "Bring Your Own Bottle." Following a loop trail through Bogue Chitto State Park, the 5 mile race is one lap and the 10 mile race is two. Crescent City Connection Bridge Run 4 Mile (Saturday, June 7th @ 6 p.m.) - The final race in the Louisiana Bridge Run Series is the longest of the three, starting on the Westbank behind Oakwood Shopping Center and finishing under the bridge near Mardi Gras World. 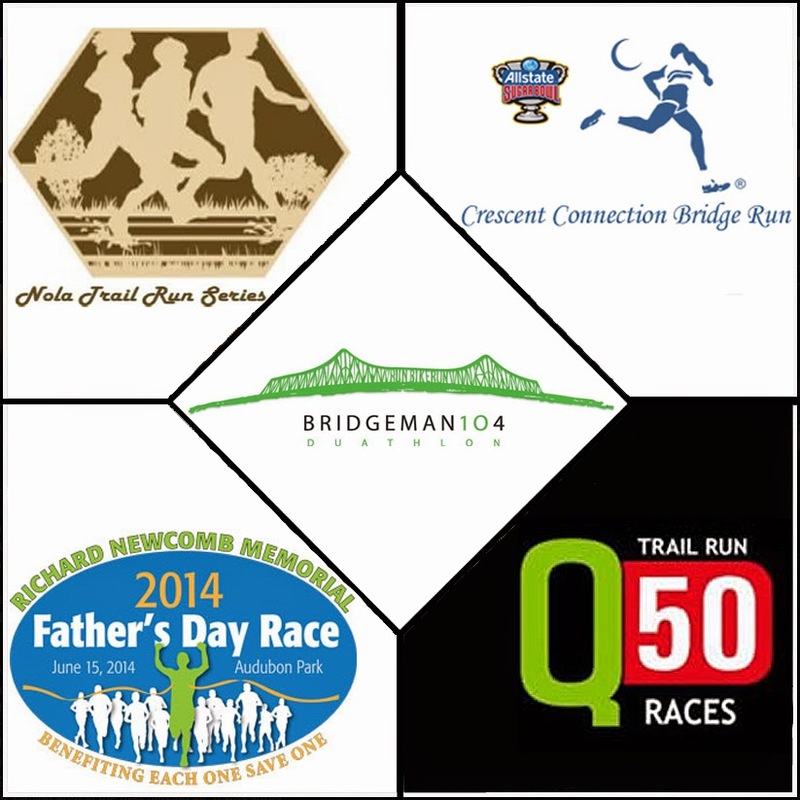 Participants in all three bridge runs should stick around to receive a commemorative medal for conquering the series. Bridgeman 104 Duathlon (Sunday, June 8th @ 7:15 a.m.) - Run 2 miles, bike 10 miles, and run 2 more miles for a finish in Downtown Gretna. Did I mention that bike ride is over the Crescent City Connection Bridge? This challenge literally brings endurance sports to new heights. All Comers Track Meet 1000M to 2 Mile (Friday, June 13th @ 7 p.m.) - No fee, no awards, just fun & great competition! Meet at St. Martin's Episcopal School in Metairie for this casual track session. Wild Pig Chase Trail Run 3 Mile (Saturday June 14th @ 8 a.m.) - The first race in the Trail Run Series, don't be surprised to see alligators as you run by the canals of the Westbank. Participants who complete all three trail runs receive a special award at the final race! Fathers' Day Race 2 Mile & 1/2 Mile (Sunday, June 15th @ 8 a.m.) - The New Orleans Track Club hosts the 12th annual event at Audubon Park. Grandfather or Father / Son or Daughter teams are all recognized with special awards at the end of the race. Summer Series Race 2 Mile (Wednesday, June 18th @ 7 p.m.) - The second edition of the the 2014 Summer Series is brought to you by the athletes with Guido Sportif and the 15th Street Flyers. Armadillo Dash Trail Run 3 Mile (Saturday, June 21st @ 8 a.m.) - The Bonnet Carre Spillway hosts the second trail run of the series, where participants are guaranteed to be muddy by the end. This is a great opportunity to "Get Off the Pavement" and check out new running paths around the city. All Comers Track Meet 1000M to 2 Mile (Friday, June 27th @ 7 p.m.) - Runners and race walkers of ALL ages and abilities are welcome to join, with past participants ranging in age from 5 to 75. Again, this is a free event with no pre-registration necessary. Coyote Chase Trail Run 2 Mile (Saturday, June 28th @ 8 a.m.) - Run through the untamed paths of the old City Park Golf Course for the final leg of the Trail Run Series. It's much more scenic than it sounds, and definitely my pick for the best trail to explore in the city.